Just wanted you to know that my son had a breakthrough moment today that he may not have recognized, but I sure did…and it made my heart smile. My 8 year-old DS was scheduled to go to a birthday party this evening for a neighborhood friend. He had been looking forward to this all week. This afternoon, he started to ask me what time the party began when he stopped himself. “Oh – hold on, Mom. Let me check the calendar.” Sure enough, he walked over to our “command center”, checked the date and got the information he needed. He was so pleased that he knew where to look and I was so pleased that the information was accessible for all of us. Thanks for encouraging good habits and providing some excellent tools to help make them stick. My son thanks you that we RSVP’d in a timely fashion, purchased presents without being in a rush, wrapped them, made homemade cards AND got to the party a few minutes early because of good habits and routines that are becoming a part of our lives. FlyLady here: Wow! This little fellow is watching his mommy use their calendar. She has it in a place where he can see it! Where is your calendar? Is it hidden in your purse or under a hotspot on your desk? Children love know what’s next and when you can show them on your calendar and teach them how to read it. Your life will be much easier when you have a calendar that is front and center. Use Coupon Code CLEAN461 to save 20%! Our new calendars are NOW in the FlyShop! If you have never used our FlyLady Calendar before, then you have a treat in store for you. We have large squares to hold all your family’s schedules. 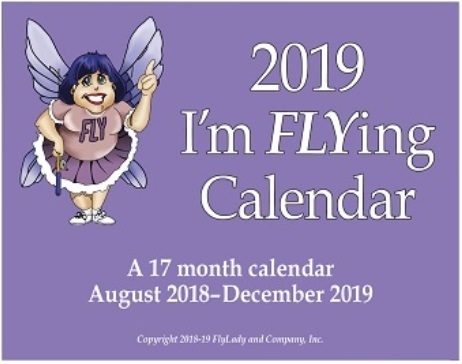 The FlyLady Calendar is a 17 month (August 2018 – December 2019) calendar and you can start using it in August for the new school year. This entry was posted in testimonials and tagged 8 year old son, calendar. Bookmark the permalink.